Senior forward Logan Padget. Journal photo by Jordan Wald. Homewood boys basketball coach Tim Shepler was cautiously optimistic entering this season, especially since he had a senior-laden team. “We had our hopes that if everything went well, we would have a pretty good team this year,” Shepler said last week, a night after the Patriots posted their 20th victory of the season with a 51-36 rout at Shades Valley. The Patriots have 10 seniors, reminiscent of the 2015-16 team that won the Class 6A state championship, the first boys basketball title in school history. Senior forward Logan Padgett was a freshman that season, so he understands what experience means to a team. With such an experienced team, practices sometimes are more competitive than games. Since starting the season 5-3, Homewood has gone 15-3 with winning streaks of six and seven games, plus two strong showings in tournaments in December. The Patriots traveled to Orlando, Florida, the week before Christmas for the KSA Events Classic. They dropped their opener 50-43 to Palos Verdas Peninsula (California), but bounced back to beat Monarch (Colorado) 50-31, Bishop Shanahan (Pennsylvania) 59-56 and Dunbar (Florida) 59-48. It’s no coincidence that happened with the return of senior guard Larkin Williams. He missed the first 14 games of the season because of a foot injury related to football. Williams, who has a scholarship offer from Berry College to play football and basketball, was the Patriots’ starting quarterback as they reached the Class 6A quarterfinals before being eliminated by eventual champion Pinson Valley. “He knows what we need and the ball happens to be in (his) hands a lot,” Shepler said. After Christmas, Homewood won the Metro Tournament, which it hosted. The Patriots beat Woodlawn 48-38, Spain Park 49-28 and Oak Mountain 40-36 in double overtime in the championship game. The 6-foot-5 Padgett is having a strong season. He leads the team in scoring, averaging 14 points per game. He also averages 6 rebounds. He has committed to play college basketball at Samford, where his dad, Scott Padgett, is the head coach. Senior wing Jack Dorough is another solid player and one of the team captains along with Padgett and Williams. Sophomore guard Bo Barber has been steady. He’s the younger brother of Hannah Barber, who starred on the Homewood girls team and is now a freshman at Alabama. 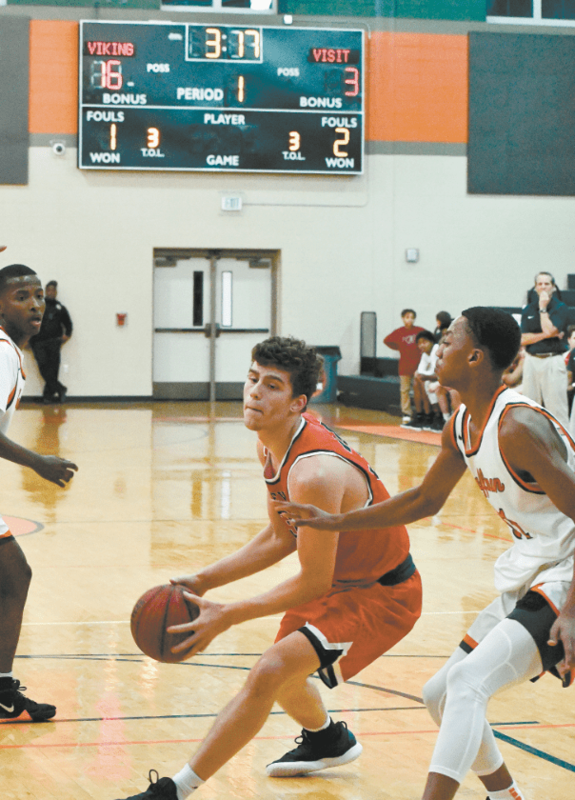 Bo Barber is the Patriots’ second-leading scorer at 9.2 points per game, and he made a 3-pointer at the buzzer in a 41-40 victory against Spain Park on Jan. 4. “He’s a tough, gritty player and he’s extremely skilled,” Shepler said. Junior guard Marcello Nanni has gained a reputation for taking charge, and freshman guard P.J. Davis has been a pleasant surprise. Padgett’s younger brother Lucas, a 6-foot-2 sophomore center, also is on the team. The Patriots (20-6) entered this week with only four regular season games remaining before the start of the Class 6A, Area 10 tournament. Huffman will host the area tournament because it beat Homewood twice, including a 50-49 overtime decision last Friday. Shepler believes his team will be a contender in the postseason, but he said it will be a challenge to reach the state tournament.